It's not unusual to find Hamilton watches for sale with unique colored dials. 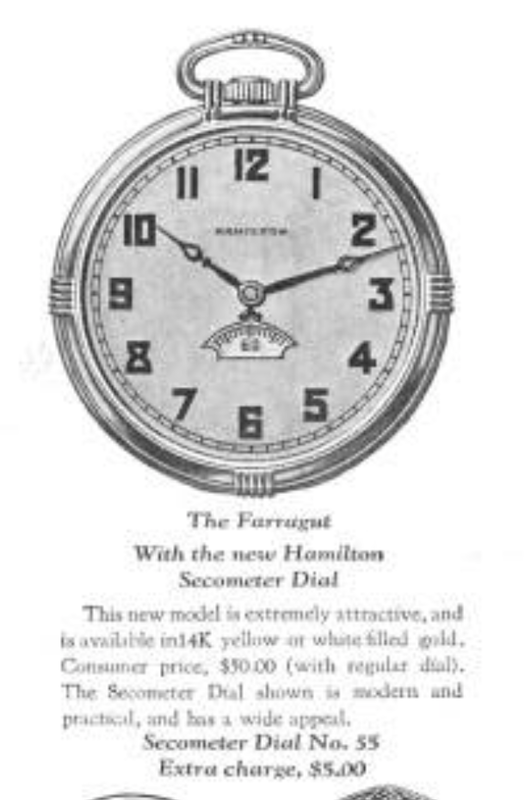 What is unusual is to find Hamilton watches with authentic dials with unique colors. 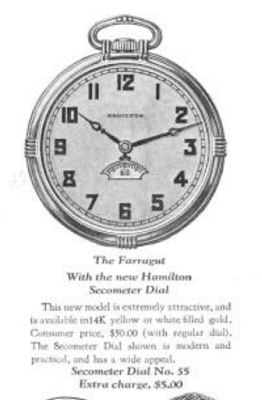 For the most part, Hamilton designers used white, silver, or black for dials and on a few occasions gold and sometimes rose-colored dials were used. Of course there are exceptions to every rule but if you find a Hamilton model - especially from before 1960 - with a boldly colored dial, then buyer beware. All bets were off in the 1970's though. All sorts of colors were introduced and even the 1960's had models with very unique dials. Take for example, the 1974 Accumatic A-515. It was produced though 1974 and featured a bright orange dial. The catalog image just doesn't do the real watch any justice. I think the Accumatic A-515 is an interesting blend of old and new, at least as for as the 1970's concerns. To look at the watch, it looks like the typical funky, chunky 1970's styling but it has a 1960's movement under the hood. My project watch arrived with a noticeable clunk coming from the inside. I thought for sure the oscillating weight must have come off. I was unable to open it though, as the screw on back was on TIGHT. Looking at the case back reveals it to appear like the usual 1970's models. 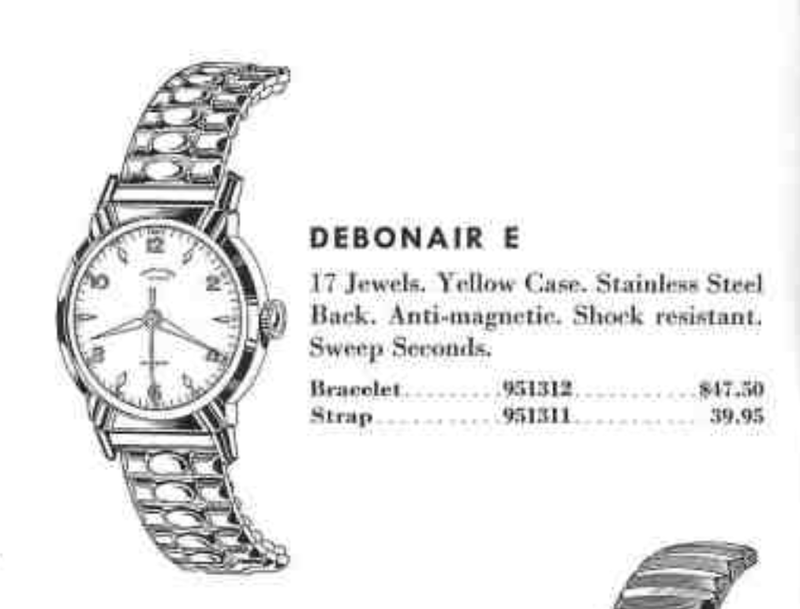 However, there is one interesting detail to be seen - the model number for this watch is 689032-3. The -3 means it has a stainless steel case. The 689 is an indicator of the movement inside. You will usually see this type of watch start with an 8, for an 825 or 818, etc. movement. I had to purchase a new case wrench in order to open the watch. It's a high quality wrench and costs 10 to 15x the price of a "cheap" wrench. In this case (pun intended) it was worth it, as I was able to get inside. 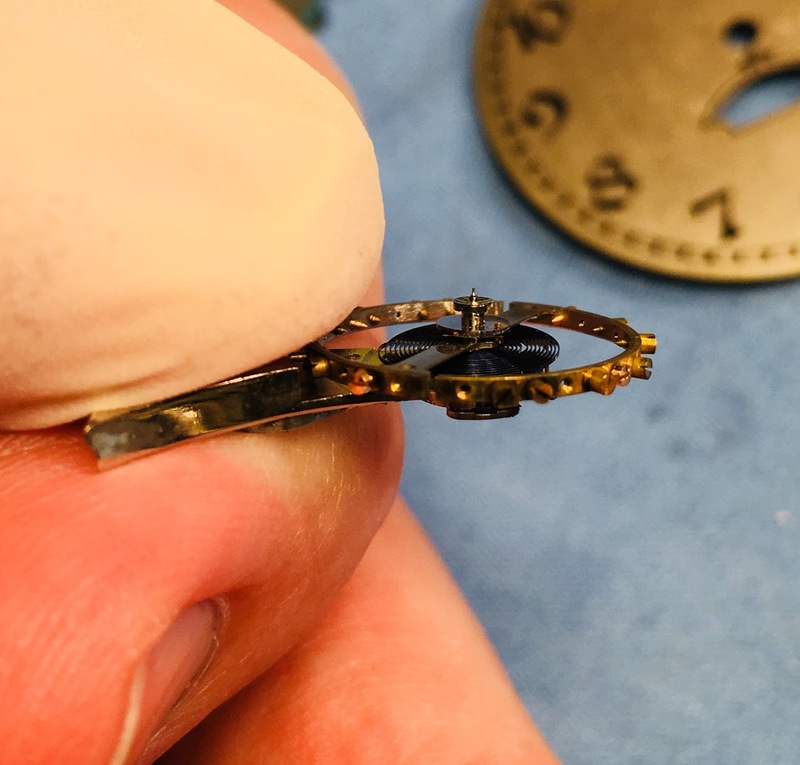 You can see below that the movement is a 17 jewel 689A, also known as a caliber 63 - although the 63 has 4 additional jewels in the automatic framework, bringing the total to 21. You can't really tell in the photo, but the rotor has come slightly unscrewed from the framework and is wobbling. That was the cause of the clunking noise and will be an easy fix (tighten the screw). While the parts are in the cleaner I will try to polish and dress the case. This case has a brushed finish on some surfaces and a bright finish on others. First I'll try to de-scratch the brushed finish and then tape it off so I can polish the bright surfaces. The basic movement is back to running order. It has good motion so I suspect the timer will bring good news. No complaints here... good beat rate, good amplitude, no beat error. Other than a couple of tiny pieces of lint on the crystal, I'd say this watch turned out very well. I'm sure an orange dial isn't for everyone but I'm sure there are plenty of Clemson or Virginia Tech fans that might like to have one. My light tent is merciless when it comes to photos, so here's a wrist shot with the watch in more flattering light. Definitely makes a bold statement. I suppose a watch from the 1990's would be considered "vintage" by many standards. I think you could make a better argument that it would be considered a classic, at least this next post anyway. 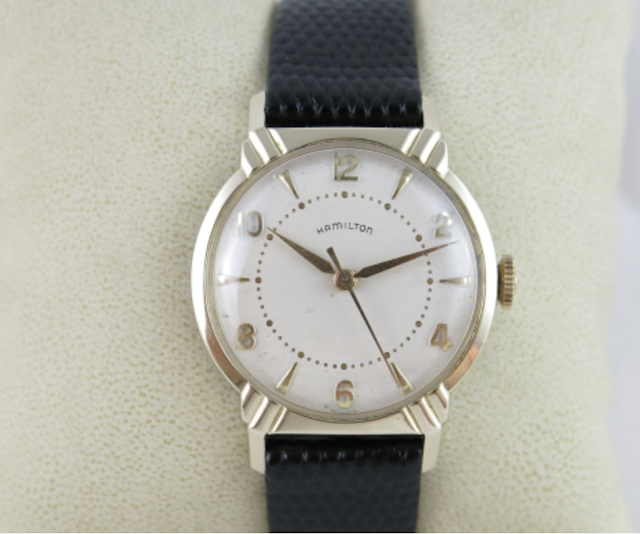 Back in June I did a post on Hamilton's most modern military watch, the Mil-W-46374D, Type 1. There are a number of Hamilton military models and quite a few fakes out there too, by the way. The 46374D is arguably the best, in my opinion. The GG-W-113 is a very close second. The Mil-W-46374B is okay and looks almost identical but it's really meant to be disposable. Unless it was in great shape, I'd pass on most 46374Bs. One thing you'll find often posing as a military watch are the early Khaki models. You'll also find Khaki models with the LLBean logo. They're basically built the same way as military watches and even use the same movements. Back in the Spring I restored a GG-W-113 as well as a British military W-10 field watch. They both feature the Hamilton 649 movement which was based on the ETA 2750 caliber. 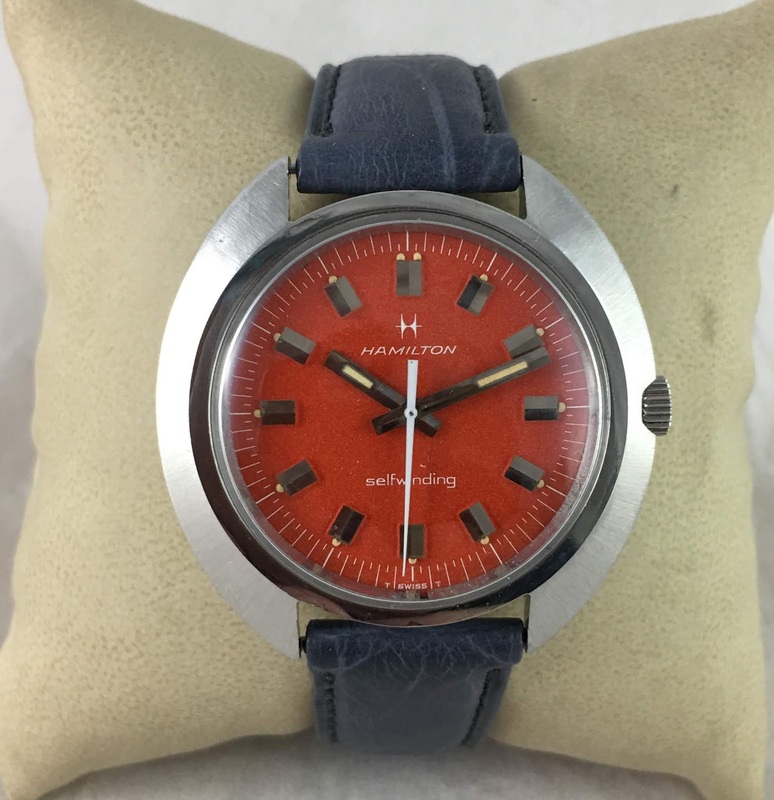 As I found out, there are a variety of Hamilton models from the 1970's and 80s that used the 649 movement. One of them was an early Khaki field watch. I recently came upon another Khaki field watch in serious need of some TLC. I suspected it would also have a 649 movement, but I was pleasantly mistaken. As received, you can see it has seen better days. It's quite beat up and the minute hand has lost most of its lume. 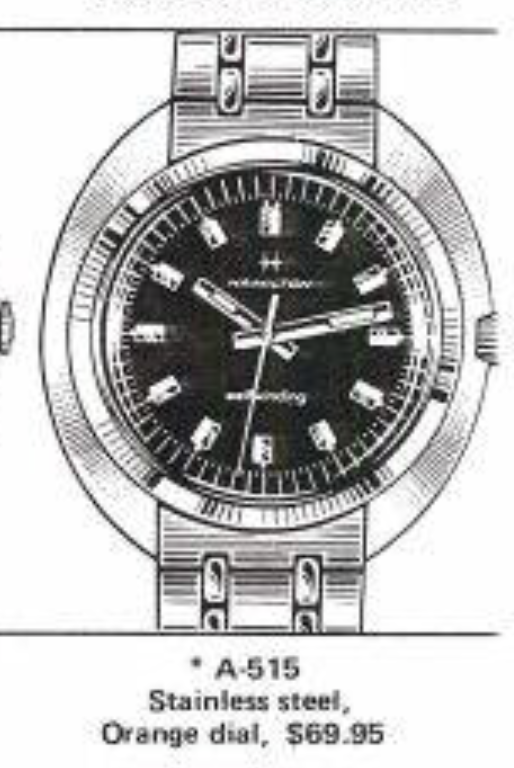 Notice this watch doesn't have fixed spring bars. It was intended to be used with a two-piece strap. The case is a two-piece design, which I personally prefer since you don't need to contend with a rusty two-piece stem like on most front-loader designs. The model number of this watch is 9415A. I'm not exactly sure what years this was made but my guess is mid-to-late 1990's. Low and behold, inside is an ETA 2801-2. This is the same movement that is used in Hamilton's new Khaki Field watch that was re-introduced this year! It's also what you'll find inside a Mil-W-46274D Type 1. Once the hands are removed, there are little levers on opposing side that you swing out to free the dial feet so the dial can be lifted off. The 2801-2 can be outfitted with a date complication and you can see the empty spaces where those parts could go. Based on the luminous dust under the dial, this watch is long overdue for a cleaning. This movement has a hack mechanism and the golden lever is temporarily attached to the bottom of the barrel bridge. You can see 2801-2 and the ETA logo stamped under the balance wheel. While the parts are in the cleaner I will clean and repaint the luminous hands. I will also need to install a new crystal. These models have a reflector ring that is a matte silver, just like the case. So I will save the reflector ring and use it in the new crystal. Looks like 28.5mm will do the trick. I like the profile of Stella WRA crystals and they're my go-to choice for these applications. I need to remember to reinstall the gold hack lever. Most watches don't hack so it's easy to forget this very specialized part. It engages the clutch wheel and pivots when the watch is in time-setting position. The long side of the lever will just touch the balance wheel and stop the watch until the clutch moves back into the winding position. The watch is ticking away. The 2801-2 has a 28K beat per hour rate so it's noticeably faster than a garden variety vintage watch with an 18K BPH rate. 28K is crazy fast in comparison. Whoa... something isn't right. Maybe a spec of dust on the hairspring or pallet fork. 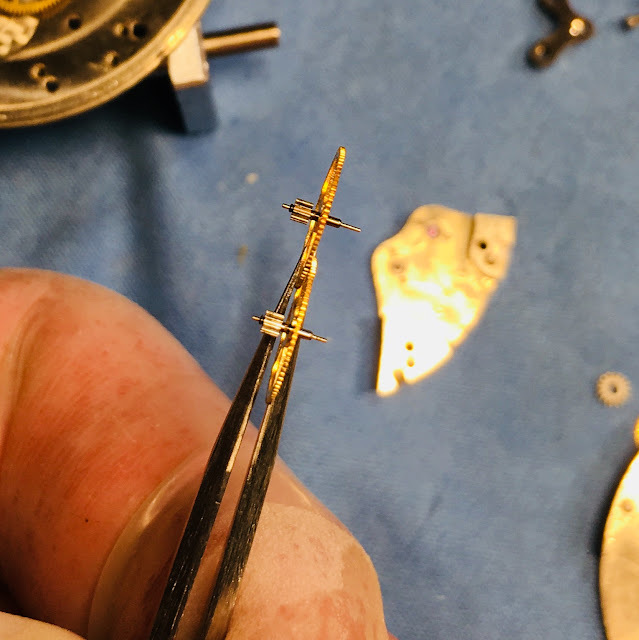 I recleaned the hairspring several times and finally got a clean signature. The amplitude is a little low but that could be related to having not wound the watch up a lot. Well, a new crystal and fresh luminous paint makes a world of difference, don't you think? This watch looks very similar to the new Khaki field watch but it's a little smaller. 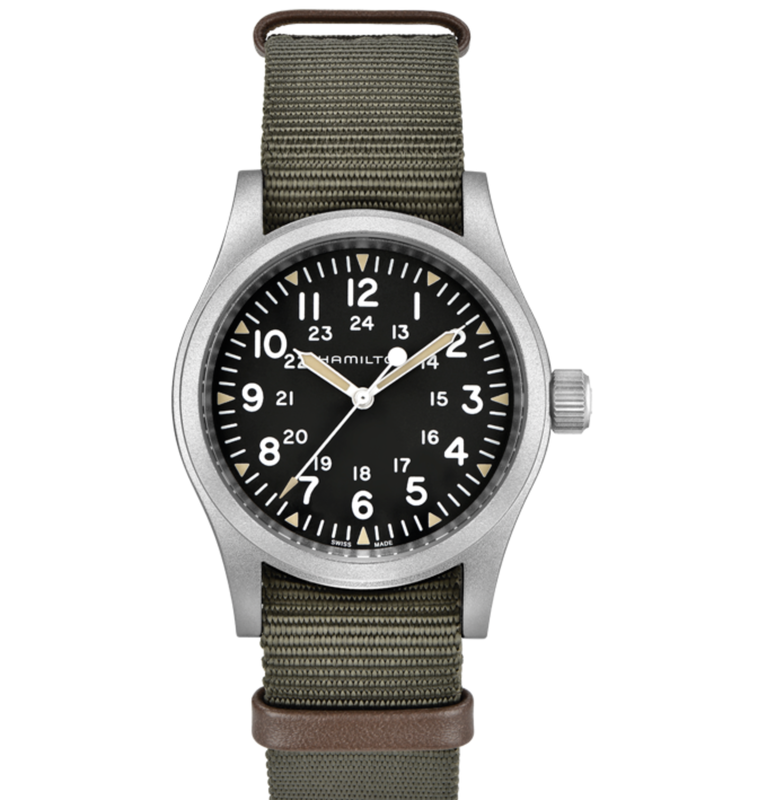 Here's a photo of Hamilton's new Khaki Field Mechanical. I think it's more closely inspired by the Mil-W-46274D but there's no doubting the strong family resemblance. The new model is 38mm in diameter while my project watch is closer to 33mm. Before the 9415A there was the 921980 (I'm guessing from the 1980s). Can you spot some of the differences? First, the older model uses the stylized H and modern italic Hamilton logo. The 9515A used the more vintage sans-serif logo that WWII-era watches used. It's the same logo the new Khaki Field Mechanical uses too, by the way. Also, the numbers on the 9415A are slightly bolder than on the 921980 version. You can't tell from the outside that the two Khaki models use different movements. The locations of the dial feet are not the same so dials are not interchangeable, even though they are both based on ETA grades. Just to spice things up a little more, here are the two Khakis with their big brother, the Mil-W-46374D. The military watch (with the red strap) does not say Hamilton on it - at least on the outside. The hour markers are triangles, as opposed to dots. So you can see the new Khaki Field draws most of it's inspiration from the Mil-W-46374D, including using the same movement - the ETA 2801-2. I try not to do posts on models I've already done but sometimes I make exceptions for something interesting. Back in 2013 I did a post on the 1956 Essex and that post was a bit unusual since the watch had an uncatalogued dial. 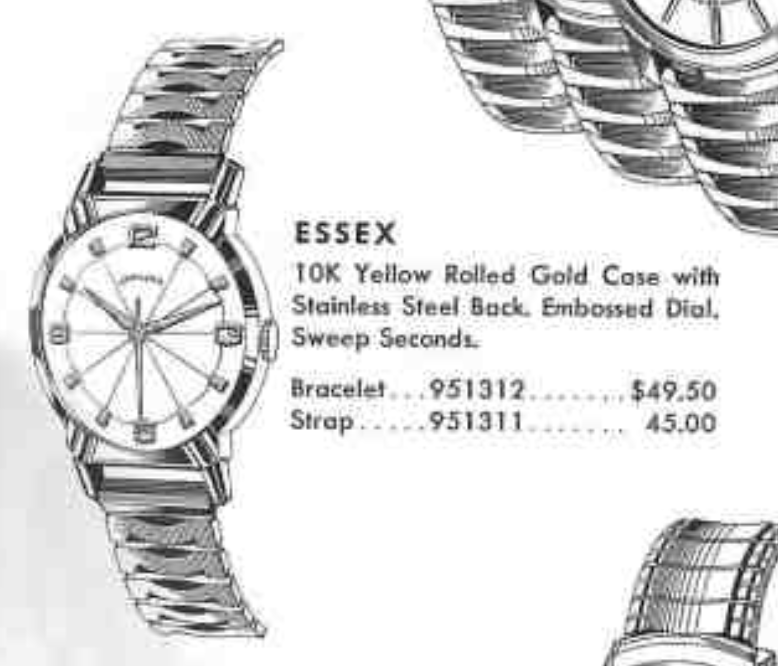 I've seen other examples with the same dial, so I'm fairly confident it's a legitimate Essex. 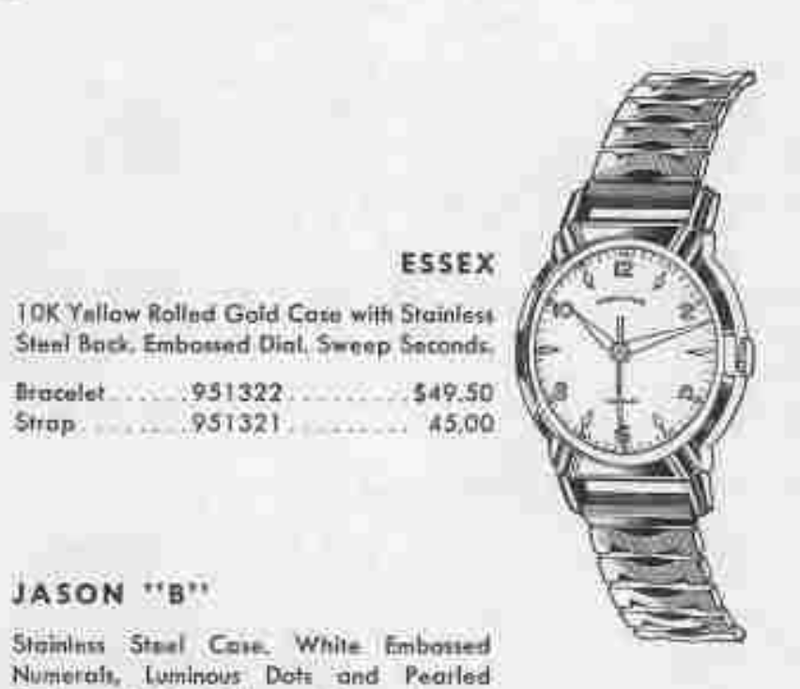 I recently came upon another Essex in the wild with another dial, and I realized it was the dial variation introduced in 1957 and continued in 1958. 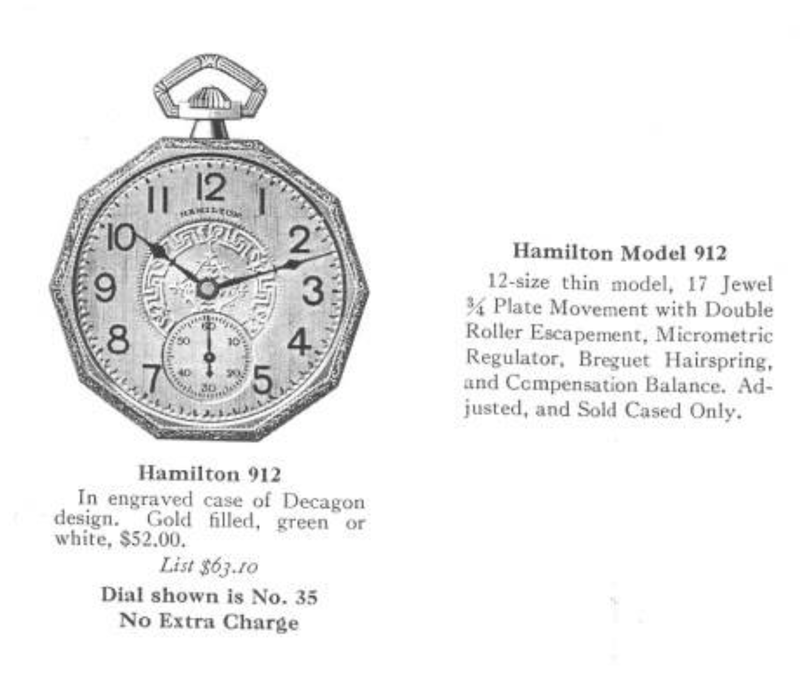 Originally the Essex was part of the Hamilton Illinois line and called the Debonair E. It had numerals at the even hour positions and markers at the odd hours. The markers appear to be arrow heads at 3 and 9 and diamonds at the other positions. You could get the watch on a special bracelet or on a strap. In 1956 the Illinois line was dropped and the Essex was introduced. The bracelet was changed to a different style but the dial appears to be the same pattern as on the Debonair E. It also appears to say something above the 6, maybe "incabloc" but that would be very unusual for a Hamilton model. Perhaps this dial pattern was changed and not actually used? I don't recall ever seeing an Essex with this dial but I can't claim to have seen them all either. Anyway, in 1957 the dial pattern was changed to a unique textured pie-pan design with numerals a 12, 3, 6 and 9 and keystones at the other positions. The same bracelet was offered. This design continued in 1958. My project watch caught my eye because I immediately recognized the shape of the Essex bezel but the dial struck me as unusual. When I realized it was legit I decided I wanted to see it in person. 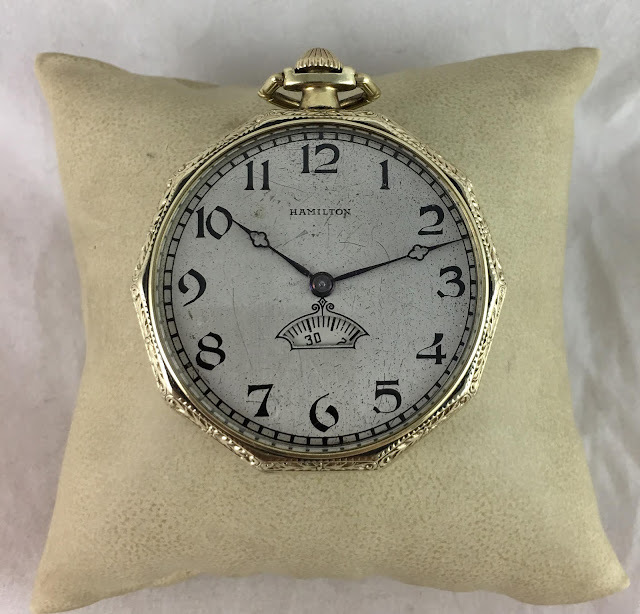 As received it has a lot of wear to the high points of the bezel and it must have had a bracelet originally, as there are grooves worn into the insides of the lugs. The back is stainless steel and otherwise unremarkable. Without the crystal in the way, you can see the dial has a unique texture and the shape of the pattern inside the markers reminds me of a flower. 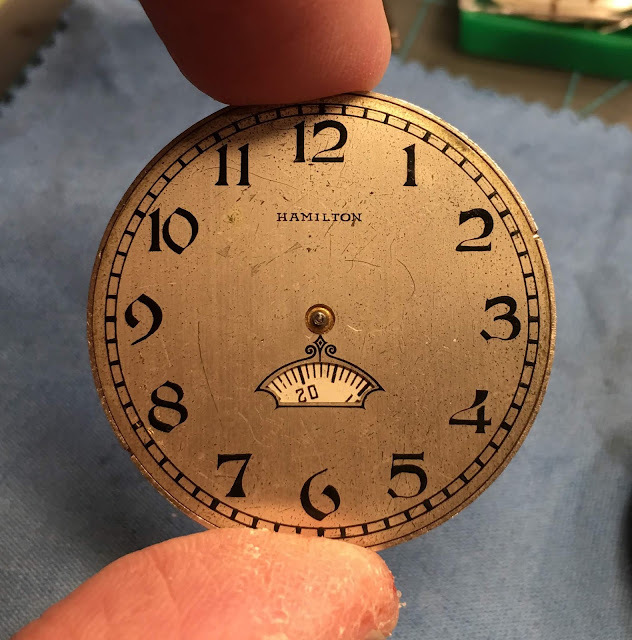 The word HAMILTON is a bit faint so I will have to be very careful cleaning the dial or I could lose it completely. 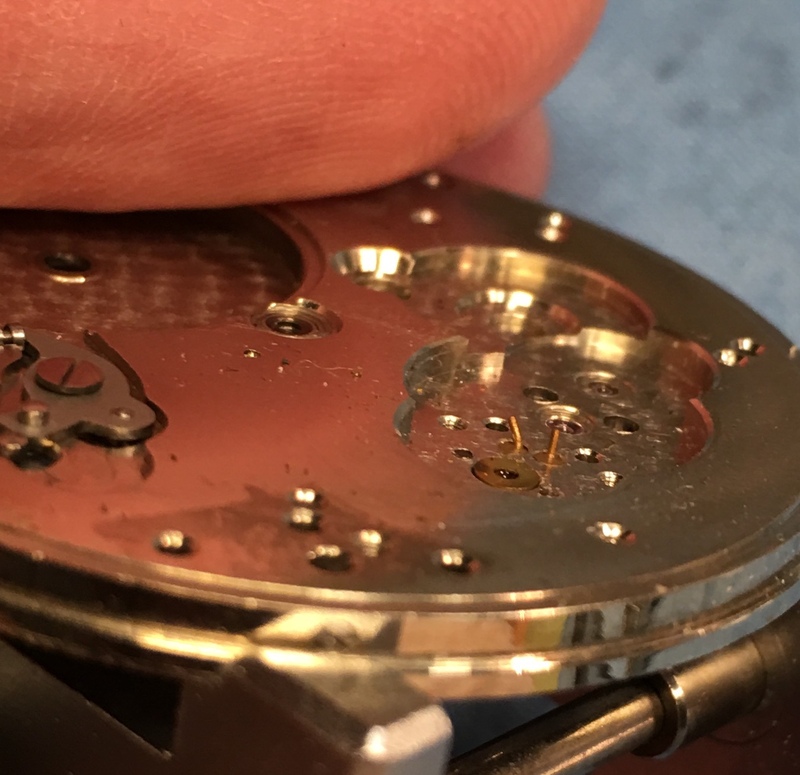 This watch has been through a lot of watchmakers' hands, there are number of marks inside. The Hamilton 671 inside is based on an ETA 1080 and largely like the automatic version of the 672 but without the automatic framework strapped onto the back. I'll prep a new high dome crystal for installation while all the parts are in the cleaner. 28.1mm should do the trick. Everything is ready to be reassembled. The movement is noticeably brighter now that it's clean. There are lots of brass spots showing through the nickel plating. This watch has seen a lot of use. According to the timer something is going on inside and making extra noise. It doesn't take much, just a tiny spec of dust on the hairspring or pallet fork will cause the timing to vary. 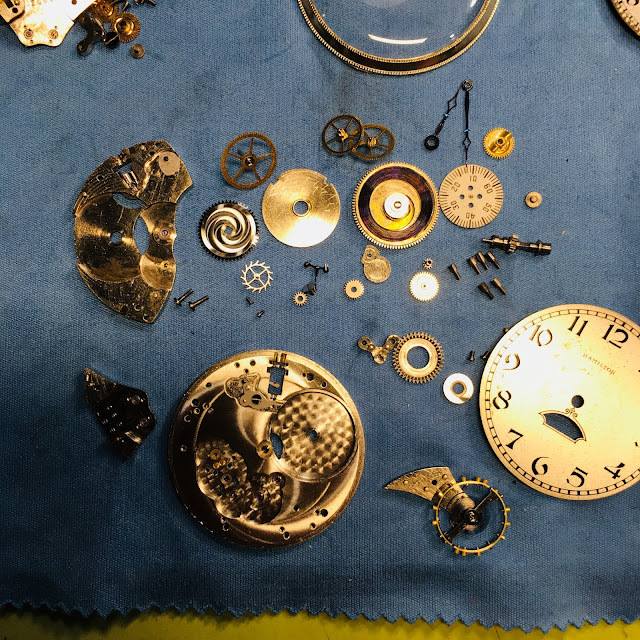 I recleaned the hairspring and voila! The watch is running a little fast but that's nothing a tweak or two to the regulator won't fix. A poke here and a tweak there... eventually I get the beat rate to even out at 10 seconds fast per day. Not too shabby. Well, this tired old watch doesn't look too terrible with a nice strap and a fresh crystal. It certainly runs like it's still spry, considering it's at least 60 years old!